It took us three dives, but we have finally sighted the elusive pygmy seahorse. This tiny creature is, perhaps, the ultimate testament to the miracles of evolution. 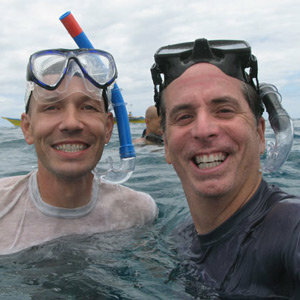 (I’ve said it before, Darwin would have loved scuba diving.) But finding these little guys isn’t easy. After several minutes of searching a large sea fan gently clearing debris and carefully examining each branch, our divemaster pointed out the ultra-tiny seahorse, which was about 1/3 of an inch (8mm) long. When he first pointed it out, I mistook it for a part of the fan. I stared at it for several seconds before I realized “the tiny piece of fan” had an eyeball. 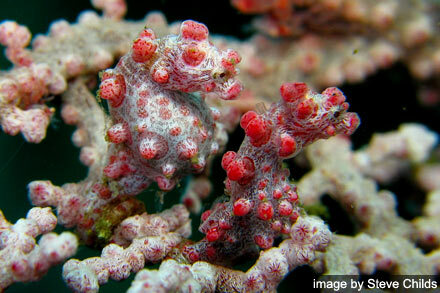 Its unbelievable adaption to the surrounding fan branches allows the tiny seahorse to blend in perfectly. Man, the underwater world really blows me away!